Facebook Messenger's feature improvements aren't stopping with the recent chatbot push. 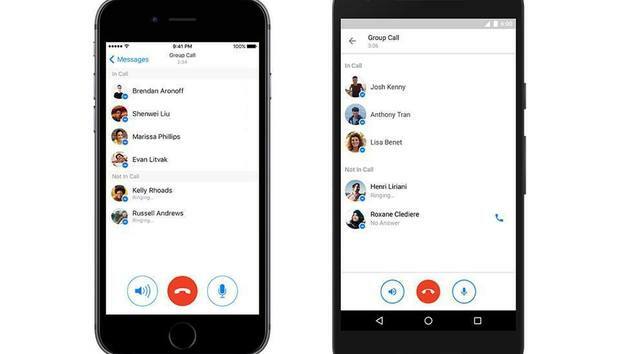 Now, anyone with Messenger for Android or iOS can now initiate a group voice call for up to 50 people. The feature builds on Facebook’s group text chatting feature. Inside a group chat, you should soon see a red phone icon. Tap that button and your call will start. Once the call is ongoing, a new screen allows you to manage participants. Users should see the phone option worldwide by Thursday, Facebook messaging chief David Marcus said in a recent post on the social network. The new calling feature applies only to voice calls. Video calls are still a one-to-one affair, but that may change in the coming months as Messenger looks to reach feature parity with Hangouts and Skype. Tech companies appear to believe that messaging apps are the next great frontier for gaining and keeping users. That’s why Facebook has been so hard at work adding new features over the past year such as third-party app integration, bots, payments, and more. Why this matters: With 980 million users worldwide, Messenger is easily one of the most popular messaging apps in the world. That puts it in a good spot if “messaging apps as a platform” is truly the next big thing in consumer technology. It’s far from clear, however, if all these additional features to Messenger will catch on with most users—or if bots, games, and payments will remain niche features appealing to a small audience.